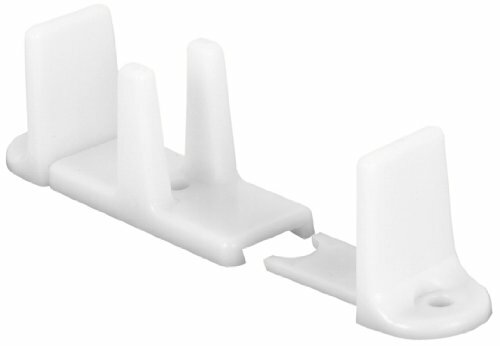 This sliding closet door bottom guide is constructed of plastic and comes white in color. 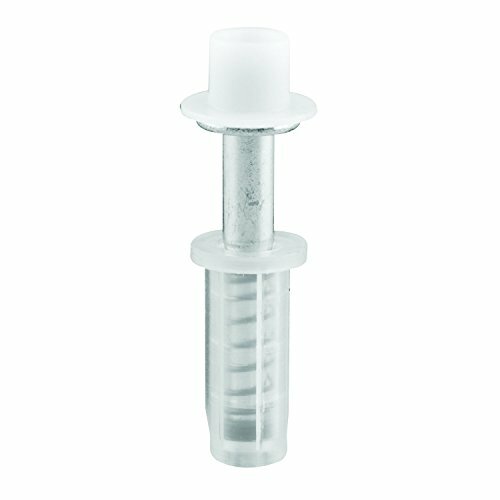 Each bottom guide mounts with 2 fasteners and they are designed to accommodate 1-3/8 in. by-passing closet doors. This pack supplies 2 pairs of by-passing doors, or one 3-panel door system. The mounting holes of these floor guides are spaced apart at 4-3/16 in. from center to center, and they feature 1-1/8 in. tall supports. 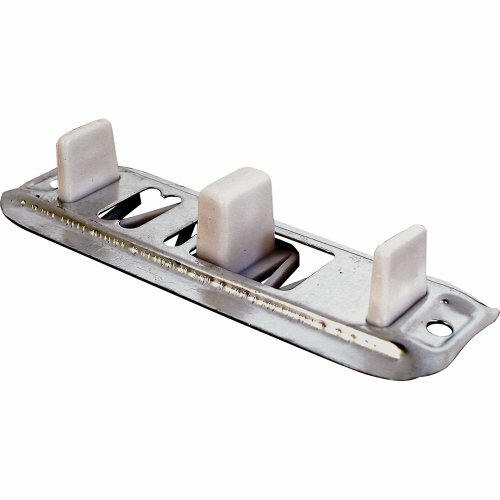 These by-passing sliding closet door bottom guides are easy to install and are used by many closet door manufacturers. The guide features a steel constructed base with nylon tips. It easily fits a 3/4 in. to 1-3/8 in. thick bypassing door. It also features an adjustable bottom mount bracket and fits Acme and similar styled doors. This wardrobe door guide is constructed from nylon. It features an adjustable bottom mount design and includes 1-1/4 in. high door spacer pins. 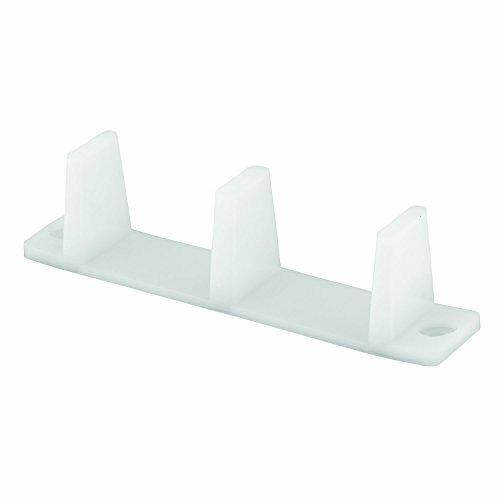 Fits 3/4 to 1-3/8 in. thick doors. 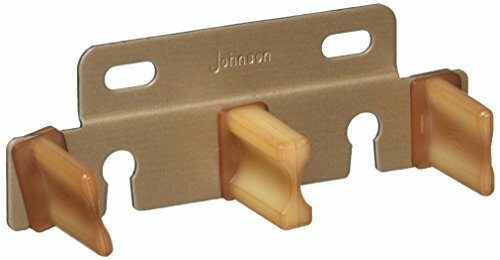 This wardrobe door guide is constructed from nylon. It features a universal design that easily mounts to your floor with screws. For use on 1-3/8 in. thick bypassing doors. 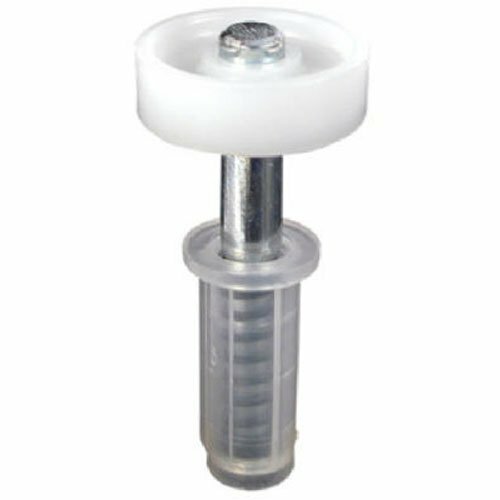 This bi-fold closet door top guide wheel is constructed of a plastic wheel and base, with a steel shaft and spring. The outside diameter of the wheel measures 7/8 inches, and the base diameter measures 3/8 inches by 1 inch in height. This assembly features a spring-loaded action to ensure the wheel rolls consistently within the bi-fold track above the doors. This bi-fold closet door top guide wheel assembly is used by Acme, Stanley, Kenna Frame and other bi-fold door manufacturers. This bottom guide is constructed from nylon. It can be adjusted to fit a 3/4 in. to 1-3/8 in. thick door. 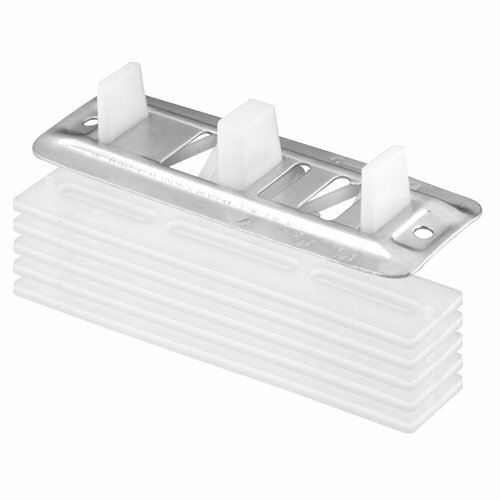 It includes thin plastic risers to help raise the guide above your carpet in 1/8 in. increments. Spring loaded top guide and pivot. 3/8" diameter cap with 3/8" diameter plastic base. Used by several closet door manufactures. 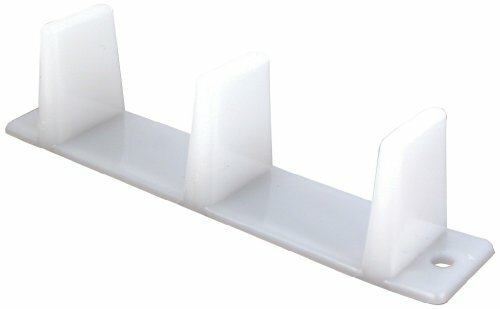 Compare prices on Closet Door Guide at Shopsimal.com – use promo codes and coupons for best offers and deals. We work hard to get you amazing deals and collect all avail hot offers online and represent it in one place for the customers. Now our visitors can leverage benefits of big brands and heavy discounts available for that day and for famous brands.